Lightweight User Interface Toolkit (LWUIT) version 1.3, released in December 2009, consolidates the modifications over version 1.1 initiated in version 1.2 and incorporates some new ones too. It also introduces three new components -- Tree, Table and Spinner. The use of the Tree widget is demonstrated through the LWUIT Demo that comes with the LWUIT download bundle. In this article we examine the changes with respect to Style and go on to check out Table and Spinner. 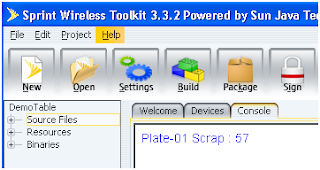 The demo applications have been developed on the Sprint Wireless Toolkit 3.3.2 (SWTK). Not only does this toolkit support LWUIT extremely well, it also has an interesting array of device emulators like those for HTC Touch and Samsung Instinct. If you intend to try out LWUIT, I would strongly suggest that you install the Sprint WTK on your computer. Fonts for writing text on it. Background type -- specifies whether the background has an image or a color gradient. An image can be tiled, scaled or aligned (unscaled with alignment). A gradient for background can be linear (vertical/horizontal) or radial. Background alignment -- if an image (tiled or aligned) is used for the background, the alignment (top/bottom/left/right/center) is defined by this attribute. Background gradient start and end colors. A Style object holds all these attributes for each state of each component that is used in an application, and has appropriate accessor methods. In addition this class also has the ability to inform a registered listener when a style object associated with a given component is altered. In the early days of LWUIT, that is up to version 1.1, there used to be just one Style object for each widget to be displayed. This single Style object had separate attributes corresponding to the different widget states. For example, the background color for the unselected (unfocused) state would be defined as bgColor and that for the selected (focused) state as bgSelectionColor. The code for setting these colors would look like this. However, as of version 1.2, this has changed. Components now have distinct styles for each of their permissible states. Most components would have a selectedStyle and an unselectedStyle. Components like buttons and those that extend the Button class will have an additional style corresponding to the pressed state -- the pressedStyle. So, the above code sample will now look as follows. Note that we have used two different versions of the getter method -- one for each style. Actually, the Component class has a getStyle method too, which returns the appropriate style depending upon the state of the component. This capability leads to simpler coding especially for methods that render components. When a component is created, a default Style object gets associated with it as its unselectedStyle. 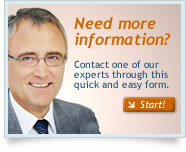 The other styles are created when accessed for the first time through the corresponding setter or getter methods. There are several ways for setting and modifying attributes as shown in the following list. By using the get*Style().set* combination as above. By creating a new style with the desired attributes and then invoking the set*Style method to set the new style. However, currently this approach works for selected and unselected styles. In the following section we shall check out a simple demo application which shows how styling can be done under LWUIT 1.3. Figure 1. Style Update Demo. The screenshot above shows a screen with two labels and one button. Labels, by default, cannot receive focus and the topmost widget is such a label. The second label has been explicitly made focusable as shown by the code snippet below. This style is set as the unselected one for all labels by calling the setComponentStyle(String id, Style style) method. This is shown below. The unselected style for the button is set in the following way using the same style object that is used for labels. 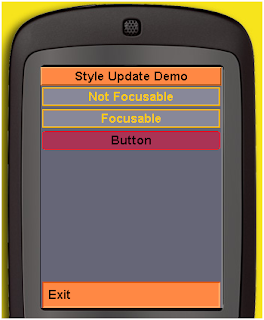 Figure 2 shows the same screen as above with the button in the selected state. Figure 2. The button is selected. We can see that both labels are unselected and their appearances are the same. The button, which has focus, looks just like focusLabel in Figure 1. This is ensured by creating a style with attributes that have the same values that were used for the selected style of focusLabel. This new style -- buttonSelStyle -- is then installed as the selected style for the button. The result of pressing the button can be seen in Figure 3 below. Figure 3. The button is pressed. In the demo application above, style attributes have been set programatically to show some fundamental aspects of styling. In real life applications, though, it would be advisable to apply themes. In the beginning there was the Resource Editor -- a very handy tool for creating and editing resource files. 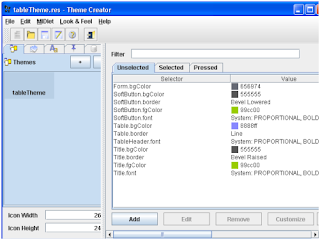 In Decemeber 2008 it was renamed LWUIT Designer, and in the latest release it has become the Theme Creator. While the essential functionality remains the same, both the LWUIT Designer 1.2 and the Theme Creator allow the creation of three distinct styles, as we can see in Figure 4. Figure 4. Creating a theme with three styles. The Theme Creator now provides support for SVG images too. This is shown in Figure 5. A spinner is similar to a combo box in the sense that it shows a single value from a list of values. However, spinner does not show a drop down list for selection. Instead the up or down key has to be used to scroll through the list. Also, a spinner can show only a date, time or numerical value. Figure 6 shows a form with two components: a button and a spinner. The button has been added to show how different styles take effect depending on whether the spinner has focus or not. Here the spinner is shown in the unselected state. The Spinner class does not have an accessible constructor. One of the factory methods has to be used to get an instance of spinner. In this case we create a spinner to display time in twenty-four hour format showing hours, minutes and seconds. The method used is: createTime(int min, int max, int currentValue, int step, boolean twentyFourHours, boolean showSeconds). The first two parameters specify the minimum and maximum values for the list. The third parameter defines the value to be shown initially. The unit for all the three is seconds since midnight. The fourth is the difference between two successive values in seconds. The fifth and sixth parameters define the display format. The image on the right of the time display is called the spinnerHandle and is meant to indicate that the display can spin. The following code snippet shows how the spinner is created and the spinnerHandle is set. A word about the value initially shown in Figure 6 above: while creating the spinner instance, the value specified for initial display is 180, which corresponds to three minutes or, in the given format, 00:03:00. However, note that the step size has been specified as 40 which means 180 is not in the list. The time displayed corresponds to 160 which is the highest value not exceeding 180. The first step in setting style for the time display is to get the DefaultListCellRenderer instance for the spinner. The style attributes can then be set as shown below. The code above also sets the renderer style for the unselected state. This style becomes effective when the spinner value scrolls. To see how that works, press the down key. Now, the spinner gets focus and its appearance changes as specified by the code below. The spinner now looks like what's shown in Figure 7. Figure 7. Spinner is selected. Although the spinner now has focus, it will not respond to the up or the down key. At this stage the scrolling keys will toggle focus between the spinner and the button. To direct the scrolling key events to control the spinner display, the select key has to be pressed while the spinner has focus. Generally speaking, the select key can be used to toggle the applicability of scrolling keys between a form itself and a component with focus contained in the form. The scrolling keys can now be used to sequentially change the time displayed. What remains now is to see how we can retrieve the value selected on the spinner. The demo does this in different ways. One way is through a command. We add the Show command to the form and, in the actionPerformed method, call into the getValue method of Spinner class. shown through command : "
A second method is to register the MIDlet as the ActionListener for the spinner. If we now click on the spinner, the actionPerformed method of the MIDlet will be invoked. The necessary action can then be taken. System.out.println("Value shown on click : "
The third approach used in the demo is to add the MIDlet to the spinner as the SelectionListener. 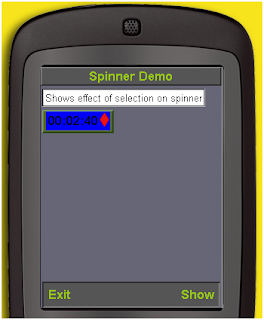 For this technique to work, the MIDlet has to implement the SelectionListener interface so that its selectionChanged method is called whenever the spinner selection is changed. When we click on a list, its selection changes, and this causes the selectionChanged method of the registered SelectionListener to be called in addition to the actionPerformed method of its ActionListener. 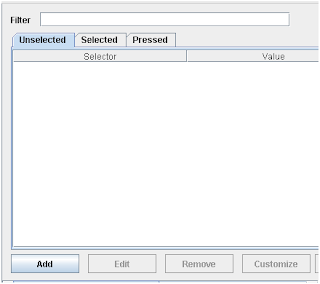 As Spinner is a subclass of List, it behaves in a similar fashion and clicking on it results in the printing of the selection change message for the demo. For a spinner, however, we do not consider this to be a valid selection change since the value remains the same. The if clause in the above code listing takes care of this issue. The resultant console printouts for all three approaches are shown in Figure 8. A table displays information in the form of a grid. The topmost row describes the name of the data in each column. These are the Headers. The rest of the table displays data and is comprised of Cells. The headers are instances of Label and are meant to be uneditable. The cells can be either editable or uneditable. Editable cells are instances of TextField while uneditable cells are instances of Label. However, uneditable does not mean unmodifiable as we shall see when we discuss the demo application. Figure 9 shows a table with 5 rows and 3 columns. The topmost row holds the headers. The rest of the rows hold cells that display data. Here we have two kinds of data: text in the leftmost column (column 0) and numbers in the other columns (columns 1 and 2). The cells of our table are labels and the default alignment is Label.LEFT. There is a method in the Table class to set cell alignment -- setCellAlignment. However, this is not a static method and works only for new cells created for an existing table. The default alignment for headers is Label.CENTER To change the alignment of cells, we need to access each label that forms a cell and set its alignment. Another point to be noted is that, for some form layouts, the sizing of the last column may not work properly. We have used a kind of rendering prototype to ensure proper sizing. All this is shown in the code snippet below. The header strings and the cell data are held within the table model. The TableModel interface defines methods to access these variables. Note that there is only a getter method for the column names while there is a getter as well as a setter method for the cell values. The Show command on our demo form uses the getValueAt method to print out a cell value on the console. The printout is shown in Figure 10. Figure 10. Accessing cell data. The setValueAt method can be used to programatically change data in a cell -- even for uneditable cells. 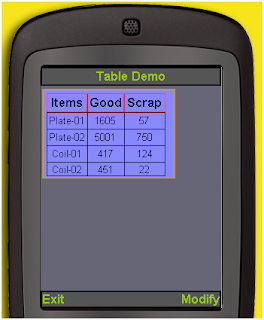 In our demo application the Show command is replaced with a Modify command which changes the data in the cell for Plate-02 Scrap from 326 to 750. The setValueAt method leads to the creation of a new label to replace the existing one. As we have already set cell alignment to Label.CENTER, the new value remains properly aligned. In Figure 11 we can see the new value for Plate-02 Scrap. Figure 11. Cell data modified. In the demo application for table, the only styling done programmatically is for the set of borders for the headers. The rest of the styling has been defined in a theme. The theme file is shown below in Figure 12. A word of caution here. This theme file has been created by the Theme Creator that comes with LWUIT 1.3. The Resource Editor that comes with the SWTK is of an earlier vintage and will not be able to open this file. Figure 12. Theme file for the demo app. We have seen how the approach to styling has been modified since LWUIT 1.1. We have also checked out the new Theme Creator and two new components that have been introduced in LWUIT 1.3. However, there are a number of interesting new features that have not been discussed here. These are listed in What's new in This Release in the LWUIT 1.3 download bundle. src_codes.zip -- source code and resources for the demo applications. LWUIT 1.1 for Java ME Developers -- useful for a detailed introduction to LWUIT basics as most of the fundamentals remain valid for LWUIT 1.3. Lightweight User Interface Toolkit (LWUIT) project home -- has a link for source code and for download. If you search for Software outsourcing Company, Symbyo Right Sourcing™ is a unique approach to outsourcing that offers the best of both worlds by blending onsite, onshore and offshore resources and locations into one smooth global delivery model. Symbyo offers Oracle Consulting and Microsoft .NET Consulting services, Offshore Oracle outsourcing services and Microsoft .NET Development services and offshore .Net outsourcing services.